Get your website to the 1st Page of Google, within 24hrs ! And discover why thousands of business's are investing there advertising budgets with Google Advertising. Google Advertising now becoming the best return on Investment Advertising in the world, because it directs people who are looking for your products or service to your website on Google. Advertising with Google sponsored links can make your web traffic sky rocket, your ads appear on the 1st page of Google where thousands of people are looking for your products or services.Whether you already have an existing account or need our Google Advertising professionals to setup, optimise and manage your advertising on Google for optimal performance, we will boost your web traffic guaranteed. 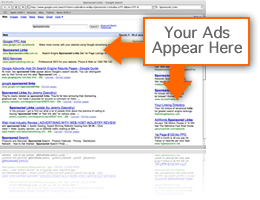 How Google Sponsored Links Programs Works ! The great thing about Google's Sponsored Links Program is that it works on a pay per click (PPC) basis, so once the setup is complete, you only pay when someone clicks on your ad.The clicks starts from as little as 5 cents a click and varies from keyword to keyword. Another great advantage with their programs is you can set daily budgets, so if you only want to spend 5 dollars a day, your ads will stop showing after your allocated budget is reached, plus there are no lock in contracts.